Linda C. Dalton, PhD, FAICP, is interim University Planning Officer at California Polytechnic State University, San Luis Obispo. Previous universities include California State University, East Bay, Seattle University, and Arizona State University (where she was an ACE Fellow). Her work has earned awards from the Association of Collegiate Schools of Planning and American Planning Association. This chapter was updated in 2016 and 2018 with an expanded section on planning beyond traditional boundaries. A more significant revision of the previous version coauthored with Robert E. Kitamura and Joseph E. Bilotta was completed in early 2015. Campus master plans guide the physical development needed to support the mission and strategic plan of an institution of higher education. They direct how various aspects of the physical environment, such as academic facilities, open spaces, housing, and circulation come together to meet the needs of the college or university.
. . . would still provide the means for guiding the physical development of the campus. A physical master plan can be labeled many ways, for example, as a physical development plan, facilities master plan, master facilities plan, long-range development plan, or comprehensive campus plan. Regardless of the title, planning for the physical development of the campus, including its open space and circulation systems, is the topic of this chapter. Universities sometimes undertake more focused plans that may be called “master plans” also, such as bicycle master plans, utilities master plans, or landscape master plans. In these cases, the use of the term “master plan” refers to the conceptual breadth or university-wide application of the plan, even though the topic is specific. Every campus must engage in long-range planning; even though the leadership devotes significant time to short-term and operational decisions, these actions should be taken in a broader context. The institution’s strategic plan builds on its mission (and specifically, its purposes considering academics, research, student life, athletics, outreach, service, and support programs). The strategic plan expresses the campus’s broadest vision of itself and how it will direct its financial and other resources toward achieving that vision. On the basis of its strategic plan, the campus develops other long-range plans, including its physical master plan. The master plan indicates where buildings, open spaces, circulation systems, utilities, and other elements of the campus environment will be located. The physical master plan must have as its touchstone the institution’s mission and strategic plan. Historically, the physical master plan has been most simply expressed on a campus map, showing existing and future facilities as envisioned within a particular time frame or completion date. However, modern plans must be more than a static image of the future. The plan must be adaptable to changing conditions and take into account both challenges and opportunities, while providing adequate guidance so important concepts are sustained and not compromised to attain lesser short-term advantages over more significant long-term benefits. One important way of doing this is to articulate principles that can direct implementation even in ambiguous or unanticipated conditions. Balancing adaptability with sound directives is a central challenge of campus master planning. The physical master plan also includes an implementation strategy or implementation program. Implementation will likely include much more detailed planning, leading to cost and funding analyses, architectural programming, and design and construction of buildings and other facilities, as well as the detailed planning and preservation of important open spaces and other physical resources. Such physical aspects of a campus are always closely tied to the institution’s natural environment, history, culture, and social, legal, and financial contexts. The physical master plan will also include measures—observable outcomes that allow the campus community to monitor whether or not the plan is being implemented, and that highlight areas where the plan is not working and needs to be adjusted. Methods and measures that can be used to track or monitor the plan’s implementation. After a brief discussion of why and when institutions undertake campus planning, this chapter addresses each of these aspects of master planning in more detail, including examples and advice for successful processes and effective plans. Purposes—Why Do We Prepare Campus Master Plans? Campuses are communities and must have the facilities—including buildings, open spaces, circulation systems, utility infrastructure, and so on—to serve their students, faculty, staff, and guests. Like any community, universities and colleges must be carefully laid out to create a physical environment that is functional, pleasant, safe, sustainable, and supportive of its wide-ranging programs. Master plans are the overarching expression of that physical environment, with an implementation program for achieving the desired conditions. Timing—When Should We Prepare or Update a Campus Master Plan? Good plans are adaptable and responsive to changes in program needs. Many campuses use a regular review to gauge progress and make adjustments to accommodate programmatic changes. Intervals of two to five years are usually adequate to recognize changes in academic programs, technology, and other needs that will drive adjustments to the plan. While a two-dimensional picture of the future campus used to be the master plan, the map is now only one visual component of a more dynamic process. Maps continue to be valuable tools, but static plans constrained by a formal map and bound by beginning and end points are frequently out of date as soon as they are printed. They become stagnant and difficult to adjust. Able to guide decisions even in unanticipated situations. The relationship between the strategic plan and the physical master plan is recursive: While the strategic plan provides direction based on the university’s mission, the master plan process can inform the campus about issues and opportunities that the strategic plan should address. Rapidly changing technology and public awareness of global climate change provide two excellent examples of the dynamic context of campus planning and how universities need to be able to respond to new circumstances and conditions. Both are addressed later in this chapter. Historically, campuses have been easy to identify visually, with grounds and buildings that are distinct from their surroundings. The development pattern or “grain” is different. Usually, the scale is larger—larger land parcels, more open space, and more massive buildings. In addition, a campus might be distinguished by a boundary wall and gates, a particular landscape pattern and vegetation, the use of courtyards, and/or a unified architectural style for groups of buildings. A significant recent development for campuses has been to move away from an isolated “ivory tower” model (once thought to be the best learning environment) to one that stresses community responsibility and leadership. This has manifested itself physically in institutions whose buildings are embedded in the community rather than separated by walls or other boundaries. And, with advancing technology, a college or university can be present virtually anywhere. Further, even a college or university that houses all of its students and has ample land to accommodate its academic and support needs is not really an island within or adjacent to its municipality. Its utilities must be connected, and services may become intermingled. While colleges and universities maintain their own infrastructure within the physical campus, they may share community facilities like water and sewage treatment plants either as capital partners or as bulk consumers. Depending upon the size and nature of the institution, they may also enter into mutual aid agreements for public safety, fire protection, and emergency services. The spatial influence of a college or university may extend well beyond the land the campus actively uses to support the academic mission. Adjacent and nearby noncontiguous parcels used by a university for educational and related purposes may or may not be visibly part of the “campus” as a distinct park-like setting, yet are important components of campus planning, particularly at the town-gown interface. Students may live in housing and patronize businesses and services nearby. Real estate holdings for investment purposes or other uses unrelated to the university’s mission are not typically addressed in the campus plan, unless perhaps they are being held for future expansion. Thus, while the typical campus master plan focuses on the traditionally defined campus itself, campus planners also need to consider the town-gown interface where campus expansion occurs, and the surrounding district as it may be defined by the city or town in which a college or university is located. The Long Range Development Plan for the University of California at Berkeley captures this range of concepts well, by distinguishing the campus park, adjacent blocks, and the “southside” that includes campus property extending further into the City of Berkeley. APPA readers are wise enough to realize that one chapter in the Body of Knowledge series can only serve as a primer on master planning. Most institutions of higher education retain consultants to assist them in master planning because the process is intensive and does not occur frequently enough to require the full range of required expertise on staff. As such, this chapter is intended to introduce the context, process, and content for campus master plans to assist APPA members in directing a master planning effort, including consultant selection. Many of the examples cited in this chapter come from larger, better-endowed institutions that have the means to update and publish their plans on the Web, and thus make them accessible to a wide audience. Nonetheless, smaller colleges and universities, and those with more modest means, can still follow the premises laid out here. Consider the importance of the mission in shaping the site design and physical appearance of a campus. Universities can, of course, change aspects of their missions as they evolve over time, but their founding conditions are often paramount. Were the founders associated with a religious organization, or were they the state legislature, or a professional association? These different origins affect not only the kinds of symbolic architecture on a campus, but also its resources for building and landscaping. A state university funded by formula prepares its feasibility analysis or business plan very differently than does a small, tuition-driven college, or a large, well-endowed private institution. Other aspects of mission that affect the physical planning of a campus include its commitment to research, to small classes, to a residential community for undergraduates, or to access for the local community. Campus planners know they need to understand the mission of the university and its academic aspirations as they undertake a master planning process. However, the organizational structure of most colleges and universities has not historically lent itself to fully integrated planning. Academic planning often occurs from the bottom up, as entrepreneurial faculty members develop new research agendas, curricula, and degree programs that are then reviewed by their colleagues and administrators at the department, college, and university levels. In some cases, the governing board, system office and/or state agency must also approve new initiatives. Another complication is timing. Budgets are continuously in flux, especially for public institutions. Enrollment planning and management may have strategic origins but focus on an annual recruitment cycle and internal processes as students declare majors and progress toward degree completion. Many academic and research programs cannot readily project needs beyond a three- to five-year period, especially with rapidly changing technology. Yet, it can take that long to plan, design, and construct a single building or major renovation. Effective facilities plans typically look forward at least 10 to 25 years. Thus, ensuring that master plans are programmatically driven can be quite challenging when the academic time frame is typically so much shorter. Classic works, like Richard Dober’s Campus Planning recognize the importance of these factors. Capital planning often follows a five-year cycle allowing for feasibility analysis, architectural programming, and fund raising. Faculty committees may provide essential input and oversight into physical planning, but in most universities, capital development reports to a different division—and master plan consultants are retained at the division rather than university level. Thus, coordination must occur at the cabinet or senior leadership level. Toward the end of the 20th century, strategic planning began to provide a framework for this kind of integrated analysis and action. Texts by higher education leaders such as George Keller assumed a visible place among presidential references, along with advocates of educational transformation. Initially, though, strategic planning for higher education focused on educational functions and operating budgets (sometimes in the context of fiscal crises). This was consistent with the intellectual roots of strategic planning in the business sector compared with physical planning in the design professions. The Society for College and University Planning (SCUP) has attempted to connect the academic, financial, and physical dimensions of university planning through its membership initiatives, conferences, publications, and technical assistance programs. Indeed, APPA, SCUP, and the National Association of College and University Business Officers (NACUBO) sponsored a joint conference in 2007 to underscore the importance of integrating all aspects of strategic thinking at the university level. In this spirit, some universities have established strategic planning functions at the cabinet level, with the explicit charge to make the necessary connections; others place the responsibility with the provost, underscoring the importance of the academic mission as the driving force behind the university’s mission. A strategic approach to campus planning can inform planning for a campus with a long history just as effectively as for a campus on a new site. Strategic planning starts by considering the campus mission, including its educational, research, co-curricular, extracurricular, and other relevant purposes. Strategic planning also involves a self-assessment such as a SWOT (strengths, weaknesses, opportunities and threats) analysis—assessing the institution’s internal strengths and weaknesses as well as opportunities and threats (or challenges) that come from its environment. This approach encourages planners to think carefully about key issues and forces that shape the institution and consequently affect the physical development of a campus. Strategic plans also articulate the campus mission and a future vision representing its aspirations as an educational institution. The vision is then converted into a series of actions that require resources in order to be implemented. Over time the plan is reviewed and modified to meet changing circumstances. 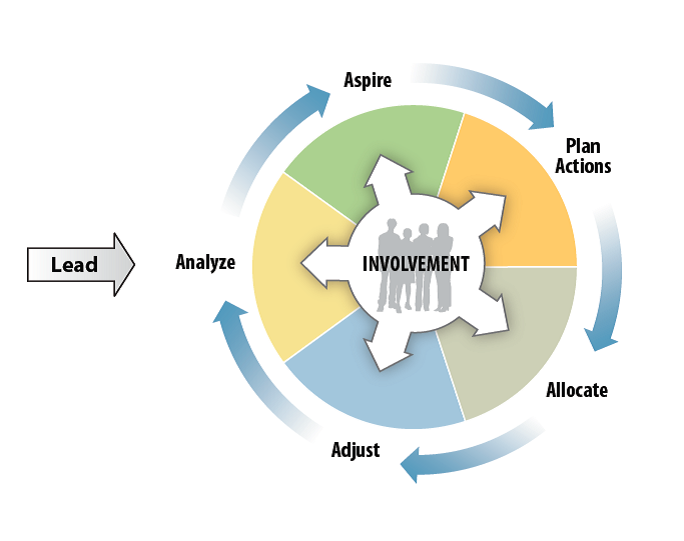 The following simplified diagram (Figure 1) shows how the process comes full circle, involving key constituents or stakeholders all along the way. The academic focus of an institution is the core of its strategic plan. In a recent article, former college president Robert Dickeson illustrates this graphically by locating academic programs at the center of all other university plans, be they physical, technology, financial, workforce, or capital budget. Among the values stated in its strategic plan, the university committed to creating a vibrant community and contributing to a sustainable planet, recognizing the importance of the physical environment as part of its educational setting. The lead consultants for the Hayward Campus master plan were hired in the summer of 2007 at the time the university initiated its academic planning process. These design professionals helped to facilitate the academic planning task force meetings. Afterward, they were able to take the understanding they developed from participating in the academic planning process forward into the vision for the Hayward Campus master plan during 2008. At MIT, we answer to a vital and demanding mission: to advance knowledge and educate students in science, technology, and other areas of scholarship that will best serve the nation and the world. Since our founding in 1861, we have continuously improved our campus to meet this challenge. To keep pace with the Institute’s evolving needs, we have developed MIT 2030: a flexible framework that helps the Institute make thoughtful, well-informed choices about its physical development and renewal in support of its mission. MIT 2030 is a responsive tool that provides guidelines for envisioning—and inventing—key physical changes on campus and in the innovation district close by. We embrace the opportunity to engage our community in this process and enrich it through collective expertise, ingenuity, and creativity. The campus setting may partly follow mission; for example, an agricultural campus needs land to support its teaching and research, either on the main campus or nearby. On the other hand, location may help refine mission; for example, a downtown campus lends itself to an urban orientation in its mission; a suburban or rural campus may incorporate residential life in its approach to teaching and learning. Campus physical development is further influenced by considerations of topography, climate, and the nature of surrounding development. Hilly terrain makes it challenging to encourage bicycle riding, for example, and very cold winters or hot summers limit the use of outdoor space. A university in a dense urban setting can take advantage of access by public transportation, reducing the need for parking facilities, and it is also likely to build upwards to expand because additional land is too expensive or simply not available. A university surrounded by residential land uses may have to provide more retail or entertainment services on campus than would a university adjacent to commercial area where such establishments are nearby. The setting also influences the nature and intensity of town-gown relationships. University campuses stand out visibly from their surroundings, so changes are often quite noticeable. Communities tend to have a love–hate relationship with their campus: They appreciate the jobs provided and general contribution to the local economy and cultural environment, but they often criticize impacts associated with traffic and student behavior. Communities are sensitive to the impacts of public and private higher education institutions because such institutions rarely serve a local population exclusively. Whether or not they are predominantly commuter or residential campuses, they concentrate large populations of young adults who are no longer accountable to parents (in contrast to K–12 students). And, while faculty and staff employees may follow a daily routine, student class schedules typically generate traffic throughout the day and around events. All of these features make college student behavior highly visible, whether students live on or off campus. University governance differs significantly from local government, starting with an appointed governing body, and sometimes including a state system and/or higher education board. Further, universities recognize a collegial role for faculty and a consultative role for student government. Finally, in most universities, academic units such as colleges, schools, and research centers operate with some freedom, particularly when their leadership has strong ties to alumni, donors, or funding agencies that provide resources independently of the university budget process. Professional programs answer to specialized accreditation agencies, not just to the university administration. Further, faculty members’ professional identity is cosmopolitan: Colleagues from other universities serve as referees for publications and for promotion and tenure. And, of course, the tradition of academic freedom protects faculty autonomy regarding the conduct and content of their classes and publications. In sum, colleges and universities are distinct from other large institutions in that they have more irregular hours and activity patterns, highly visible clientele from outside the immediate vicinity, and active internal consultation with relatively little accountability to the surrounding community. These features, along with their economic and political power, can make universities appear independent of and insensitive to their local communities. Distinguish Drexel’s campus as a vibrant, modern urban university district. Bring the campus to the street. Draw the community together around shared places. In 2016, SCUP commented in its award of merit for the University of Washington master plan update that “the project speaks to the current obligation urban campuses have about integration with the city . . . there is an infrastructure for growth that matches Seattle’s explosive growth.”The University of Florida also emphasized the importance of its relationship to the City of Gainesville in its Strategic Development Plan, which received a SCUP honor award in 2017. The plan proposes an accountable new organizational structure that enables and empowers communication and joint planning between key stakeholders like the university, the city, the county, Santa Fe College, the business community, local residents, and others. The plan’s big idea is that, by working together, UF and Gainesville can define the New American City. This is neither a campus master plan nor a city comprehensive plan. Instead, it blends elements of both, creating a new kind of partnership never previously attempted by a major university and its host city. The key physical idea is to better connect the university and the downtown core by focusing university development in the campus’s eastern third, considering downtown locations for university programs, proposing innovative fixed-route transit, identifying three major streets as connectors, and orienting the city’s redevelopment toward the university. The driving idea behind the plan is that UF and Gainesville can only achieve preeminence in partnership. In addition, the International Town & Gown Association (ITGA) was established in 2008 to address the kinds of university–community relations issues that commonly arise between colleges and universities and their communities. And, experienced city administrators have recommended ways to develop a better understanding and closer ties between communities and their universities. Like SCUP, the ITGA publishes resources, hosts conferences, and awards universities and their communities for exemplifying best practices. The following overlapping steps cover the common tasks involved in preparing a campus master plan. Every campus will need to adapt these steps into a planning process that fits its own culture and operating procedures. Later sections of this chapter elaborate on the substantive parts of the process, particularly outreach, background analysis, planning principles and design framework, master plan elements, and implementation. Presentations initiating a master plan update typically include a description of the planning process. It can be helpful to express the process in a graphic image, which can illustrate that it is interactive. The following example is from California Polytechnic State University (Cal Poly), San Luis Obispo’s 2015–16 master plan update. Obtain commitment from senior campus leadership and clarify expectations before initiating the process. Articulate the major purposes for doing the master plan update at this time (few will be plans for an entirely new university or college). What has triggered the need for the master plan? What does the institution hope to achieve? A list of purposes may include, for example, facilities for new or evolving academic programs, accommodation of increasing enrollment targets, or the provision of on-campus housing. Express as explicitly as possible how the physical master plan relates to and helps execute the institution’s mission and strategic plan. Identify the professional planning team. Given the magnitude of the tasks involved in preparing and implementing a master plan, most institutions need a professional team that consists of one or more consultants as well as some campus personnel. It is important to be clear about roles and responsibilities, particularly in coordinating consulting contracts. Develop a work program showing expected tasks, assignments, and estimated time frames, recognizing that the process is not linear but will need various feedback loops as information becomes available from environmental and facility analyses and from stakeholders. Develop an outreach program (portions of which may be formally required through environmental laws or institutional policy). Developing a careful, inclusive process usually leads to more expeditious review and approval. Start by identifying stakeholders or constituents and try to anticipate their concerns and interests. Assess how these stakeholders can best be informed of the planning process and what are the most appropriate methods for facilitating participation and feedback. Identify when their input would be most useful to the planning process and best able to generate support and participation. Keep in mind that the program may need to be adjusted during the process as unforeseen issues or concerns arise. Establish an advisory committee (or identify an existing committee that can serve this purpose), because the university will need a way to review policy and attain stakeholder support. While the committee’s role should clearly be advisory, it should represent internal and external constituencies. Describe the institution’s history and regional community contexts, including social and economic conditions. Conduct an analysis in order to determine the most important issues that need to be addressed from both a political and programmatic perspective. Undertake academic program and enrollment analysis, focusing on enrollment patterns and trends in the university’s academic offerings and other initiatives related to its mission, such as research. This analysis should encompass changes in pedagogy and technology, and address the implications of these patterns and trends on space requirements. Assess existing physical conditions and trends, including a review of the current master plan and any other related long-term plans. This should entail quality, quantity, location, and design attributes for all spaces, not just buildings. The analysis should include related site and infrastructure requirements. Analyze environmental opportunities and constraints, including campus and community perceptions of critical issues to be addressed and features to be protected, so that future development possibilities can be explored. Some aspects of environmental analysis may also be required by state or federal law. Formulate the vision or design framework for the plan. Articulate the principles that will guide the planning. We suggest the term “principles” because it implies strong guidance but not rigid, inflexible standards. Draft a plan, recognizing again that it is more than a map. Nonetheless, one or more maps and illustrations will help with the presentation and understanding of the plan. Formats are discussed further later in this chapter. Address environmental and social impacts to the extent practicable by incorporating needed mitigations into the plan itself. For example, if growth-induced traffic impacts are expected, include measures within the plan to accommodate and encourage alternative transportation systems. Conduct public review of the draft plan, based on processes appropriate to the institution. Modify the draft plan and implementation program based on feedback. Present the plan for formal adoption to the approving entity or entities. Address all required regulatory approvals. Draft an implementation strategy that includes directives for more detailed studies as well as other specific actions. Implementation measures should, to the extent possible, include some measure of progress or success. Coordinate more focused plans, including functional areas (e.g., utilities, housing, athletics), district plans (e.g., campus core), and/or college plans (e.g., medical school) as appropriate. Coordinate annual and five-year (or other short-term) capital budget programs to phase construction of new facilities and incorporate major renovations and upgrades. Initiate regular monitoring of progress toward fulfillment of the plan’s policies and programs. Establish a process for review and adjustment to changing circumstances in ways that do not violate the plan’s principles and that are not contrary to the institution’s mission and strategic plan. A master plan needs the support of the institution’s president or chancellor and provost. Without strong leadership, a plan will lack focus, credibility, and value. It is also imperative that the wider campus embrace the planning process. Numerous people and constituencies will be affected by the resulting plan, so they should be engaged in the process. Certainly, in addition to the specific executive, finance, and planning staff members directly responsible for the planning process, a wide array of stakeholders will need to be considered during that process. Increasingly, universities are using internal public relations staff or retaining consultants to develop and execute an effective outreach campaign that helps identify stakeholders, engages them meaningfully in the process, and communicates the planning process and results. Depending on the level of campus and community interest, the public relations staff might work with the planning staff to prepare press releases, issue a regular newsletter, manage a website, coordinate a speakers’ bureau, and organize public meetings and other participatory techniques. Outreach strategies will vary depending upon whether the university is trying to reach out openly or whether it anticipates criticism and therefore wants to manage opposition as well as build support. As the process begins, it is important to clarify how preparation and adoption of the master plan fit within the university’s governance structure. For example, is there a university or faculty committee or other group that has oversight? If so, it may serve as an advisory committee to guide the development of the master plan if its constituency is broad enough. If not, the university should appoint an advisory committee to guide the process at the policy level (as noted earlier in the discussion of process). One especially useful approach is to establish an advisory committee or committees that work with the planners throughout the process. An advisory committee that is generally representative of the most interested stakeholders can provide continuity throughout the process, suggest fruitful directions for further analysis, serve as a sounding board as plan concepts emerge, and facilitate communications with and support from key constituencies. However, advisory committee members need to understand that their role is advisory, as approvals are the responsibility of the university administration and governing body (regents or trustees, and possibly a state coordinating council). Typically, the chair should be a member of the university community, but not a campus planner or a consultant, as the campus planner or consultant should staff the committee and prepare agendas, minutes, and so on. Generally, the advisory committee should operate by consensus rather than by vote. Members of the university administration and campus community should constitute a majority. The number of other members will depend upon the issues associated with the campus and the intensity of external interests. Depending on the university location and immediate setting, the planning staff should inform other jurisdictions (regional, state, and/or federal agencies) in advance so that they can anticipate any political or regulatory issues. Similarly, the planning staff may brief local elected officials and the leadership of special interest groups in the area, including business and civic organizations, environmental groups, and neighborhood or homeowners’ associations. Such briefings can be used to identify potential advisory committee members, anticipate issues, test ideas, and communicate progress regarding the master plan. The staff can maintain regular relationships with such individuals, agencies, and organizations, and strategically involve the university president or chancellor in selected briefings, depending on local circumstances. If the master plan has not been updated for many years, or if the university is anticipating significant growth or other major changes, or perhaps is addressing a recent disaster (such as a fire or earthquake), or if there is a tradition of widespread involvement on the campus, the master plan process might engage the campus and community more broadly than through an advisory committee. If the university wants to encourage such involvement, it should design its process from the start to meet the university’s planning objectives. With all participation techniques, the planning staff needs to set expectations at the outset so that participants understand what they are invited to do. Some will not follow the rules, but if the goals of the process have been stated clearly, the staff can manage the input they receive. Identifying issues. While the professional planning staff and/or consultants are responsible for the technical analysis of existing conditions, environmental constraints, space needs, and the like, the broader community can be invited to identify key issues from their perspective. Establishing a vision for the plan, articulating goals and principles. Again, planning staff will be called upon to provide a professional perspective, yet the university may seek input regarding the most important goals, values, or principles that the plan should incorporate. Developing and comparing alternative approaches or scenarios. The planning process may identify some clear choices that the university needs to make before it can move forward on some aspects of the plan. Staff may ask members of the broader community to weigh in by presenting them with an analysis of the implications of going in one direction rather than another. Assessing the plan and its impacts. In some states, university master plans are subject to environmental review by law. If so, the public has a legal opportunity to review the plan and its potential impacts prior to adoption. The university can take advantage of the feedback it receives to improve the quality of the plan and mitigate adverse impacts. Involvement at all stages can be accomplished through open meetings, but unfocused public forums, “town hall” sessions, and formal public hearings are often the least satisfactory forms of involvement for both the community and the campus. Instead, the campus might sponsor open houses or use short-term task forces to provide input and feedback, or use interactive websites and computer simulations to invite discussion. Focused workshops and charrettes can be very productive, especially for visioning and for responding to different scenarios. For particularly controversial issues, a campus can use social media to track and address hearsay and rumors. If the campus does not have regular staff members who can facilitate such sessions, specialized consultants offer these services using tested techniques to ensure that the participants’ efforts contribute effectively to the development of the plan. Finally, it is important politically to document how the campus, broader community, and various agencies have been involved in and informed about the planning process. Such a record can also be helpful when formal agreements need to be reached and/or contributed to the administrative record if litigation occurs. Master plan documents for both the University of California, Santa Barbara (a public institution) and Stanford University (private) contain extensive references to regulatory compliance. A sound plan for the future campus always develops from an understanding of the institution’s history and its present situation. Whether a university has a long history like Harvard, or is relatively new, a master plan update begins with an understanding of that context. Many campus libraries and archives have special collections especially relevant to that institution’s development. Howard University’s campus plan recognizes its community context, drawing from the university’s mission and roots as an historically black university in the nation’s capital and explaining how Howard is an economic and cultural asset to the city and region. Similarly, the plan for the University of Massachusetts Boston covers both its institutional origins as an urban “expansion” university and the initial site selection and development on Columbia Point in Boston Harbor. As discussed earlier, all institutions are connected to the surrounding community and region. Thus, planners should consider the college or university’s impact on nearby jobs and housing markets, circulation systems, and public services and facilities. Analysts will usually find useful data in the U.S. Census and by contacting local governments, regional planning agencies, local and regional transportation agencies, and school districts. Planners should evaluate how the campus fits into local and regional plans and identify the policies in those plans that are most relevant to the institution’s growth. Planners recognize that certain resources are not confined to the campus boundaries but are shared across a region—air basins and watersheds are obvious examples. For these resources, regional plans may be available and relevant. For example, in places where air quality is an issue, an air pollution control district may have been formed to create a plan to implement state and federal regulations. Planners can better focus resources by identifying the most important issues driving the plan or recognizing those that the plan will need to address early in the process. Most of these will be related to programmatic changes or projections. In addition, there may be derivative issues that warrant comparable attention and effort. For example, resource and infrastructure limitations (such as water or sewer capacity) may pose issues that, while not driven directly by the academic program, must be addressed in order for program goals to be met. A common issue is the reconciliation of the institution’s plans for growth or change with the plans of the surrounding community. Especially in nonurban areas, the impacts of the college or university on the surrounding locale can be profound, and though often positive, are sometimes problematic nevertheless. Issue identification usually involves assessments of the philosophical or political contexts, as well as technical analyses. As in other parts of the process, charrettes, workshops, and focus groups can help lay out important planning issues. Important groups would include facilities staff; utility providers; local, state, and federal agencies with jurisdiction or interests affected by the changing campus; and important opinion leaders both on and off campus. For example, Cornell University listed the primary issues to be addressed in its master plan as a set of challenges. Planning generally starts with an analysis of numerical trends of such variables as enrollment, faculty, staff, and on-campus residents. Historical trends are typically correlated to facilities and infrastructure capacities and then used to develop reasonable extrapolations of growth alternatives. In undertaking this analysis, planners need to track new directions in academic programs and other aspects of the university’s mission, such as research, so that future facilities can be planned to accommodate emerging needs. Cal Poly San Luis Obispo’s 2001 master plan contains a full chapter explaining enrollment growth assumptions and directions, including the academic mix, because different disciplines require distinctly different kinds of instructional space—such as labs for the sciences and engineering, studios for architecture, and fields for agriculture. More detailed demographic breakdowns regarding characteristics such as age, gender, marital status, or ethnicity are essential to plan for changing populations. Understanding student demographics is critical, as changes in the university’s service area (if it is a regional institution) or the population it serves may affect not only interest in academic programs but also attendance patterns. For example, are evening programs becoming more attractive for employed students, or is online instruction supplanting traditional classroom learning? The mix of commuter and residential students and how it may change dramatically affects student life, particularly if the university seeks to attract younger students to live on campus. Does the university serve large enough numbers of graduate or married students that it should provide housing for these student communities? Also, in areas with high housing costs, some institutions consider offering housing for faculty and staff, so master planning must take into account the needs of a permanent residential community. A growing body of evidence indicates that college and university students in the early 21st century learn most effectively in different ways than did earlier generations. They are more technologically adept and more globally aware, and use new ways to socialize and interact. The long-time model of a professor lecturing to a seated classroom of generally passive students is evolving into new pedagogies. Current approaches such as tackling problems in teams, hands-on project-based approaches, and expanding opportunities for virtual teaching and student–teacher interactions are all indicators of new pedagogical emphases in a growing number of fields. Today, lecture halls that lack electronic multimedia, easy access to the Internet, or adequate space for student laptops and mobile devices feel archaic and dysfunctional. Indeed, new virtual teaching and learning technologies are changing the very nature of access to higher education. While some educators argue that the residential campus with teaching and learning occurring in classrooms, lecture halls, and laboratories will continue to be important in our colleges and universities for the foreseeable future, others see a transformation through online education that will greatly reduce the need for the physical campus. Campus master planners need to follow these trends as they apply to the mission and strategic plan of their institutions, and consider how the master plan should be adjusted to accommodate more support for technology, even at traditional universities and colleges with a residential student population. Campus planners also need to be concerned with the extent to which the amount and types of the space currently available determine the nature of teaching and thus limit future thinking about how teaching and learning should drive the space needs of the institution. In an ideal world, academic and research needs would always dictate the development of the amount and types of spaces on a campus. However, most institutions already have extensive facilities and infrastructure of a variety of ages and designs, so adapting their existing physical spaces to contemporary purposes poses special challenges. Furthermore, many colleges and universities must deal with legislative or administrative space allocation formulas that may be out of sync with actual needs and current pedagogies. This ongoing challenge only reemphasizes that physical master planning must be closely coordinated with academic planning, not only to accommodate the growth in specific departments or fields of research but also to best understand new pedagogical models and their needs. Planners must inventory existing buildings, their uses and capacities, conditions, and suitability for current and future needs. Depending on the institution’s circumstances, the conditions analysis may highlight factors of special relevance such as energy efficiency, greenhouse gas emissions, solar exposure, seismic safety, and accessibility. The Illinois State University Master Plan 2010–2030 includes a concise summary, including clear graphics showing the condition of the campus today. The Fresno State University master plan contains a more detailed analysis of the campus’s development potential, including the capacity to handle future enrollment growth. In 2003, Texas A&M went even further, conducting a detailed space–needs analysis and peer comparison. The study determined that the university provided less assignable square feet per full-time equivalent student than its peers, with significant differences by college. Geographic information systems can be useful for mapping the facility locations while linking them to data fields such as gross and assignable floor areas, suitability for different functions, age, and condition. Besides academic buildings, the inventory and capacity analysis must include support facilities such as faculty and administrative offices, libraries, housing, food services, child care, public safety, recreation, museums, arts venues, athletics, and other on-campus services, as relevant to the institution. Similarly, the locations, conditions, and capacities of infrastructure should be mapped, including all utilities, circulation systems, and the campus open space network. The analysis of utility capacities should include historic use trends and identification of any known growth-limiting factors, such as sewage treatment capacity or water supply. The inventory of facilities and infrastructure systems needs to address the age and condition of these capital investments, including where they are in their life-cycle. University budgets often fall behind, resulting in an accumulation of deferred maintenance projects. The master planning process is an appropriate time to take stock of these needs along with functional obsolescence. Thus, the plan can identify facilities for strategic renewal and replacement along with new construction. A separate circulation study is usually conducted by traffic engineers to establish baseline conditions and existing capacities of roads, intersections, parking facilities, bicycle facilities, pedestrian ways, and public transportation. The pedestrian analysis should include time/distance contours emanating from a central campus location in order to evaluate the proximity of facilities from a walker’s perspective, and whether or not related facilities are appropriately sited near one another. An analysis of campus open spaces should include their locations, sizes, and principal functions. Planners may choose to catalog the characteristics and survey the users of existing campus open spaces to better understand why some are popular and others less so. Such a survey could discover, for example, that protected courtyards offering southern exposures for abundant sunshine are used most intensively. Such an analysis will be helpful in locating and designing new open areas. Besides the campus facilities, an inventory of environmental conditions must be undertaken. This effort should catalog climate, weather, and winds; topography; soils and geologic conditions, including seismic risks; waterways and drainage; biota (including sensitive species and habitats); noise sources and sensitive receptors; air quality, point sources of pollution, greenhouse gas emissions and sensitive receptors; light sources and sensitive receptors; agricultural and forestry resources; and paleontological, archaeological, and historical resources. Frequently, specialists in these environmental fields are retained either directly by the institution or indirectly as subcontractors to a primary environmental analyst. The Appalachian State University master plan, for example, includes a series of maps showing the environmental factors that shape future campus development. In many jurisdictions, this information is required as part of an environmental impact assessment. Having the background information on hand during the planning process facilitates a plan’s being “self-mitigating.” That is, if potential environmental impacts from future growth can be identified early, mitigations of those impacts can be incorporated into the plan itself, increasing the possibility of lessening or avoiding impacts through its design. It should be noted that the necessary background information, while often voluminous, need not be contained, encyclopedia-like, in the body of the plan. A summary is usually sufficient there, with the more detailed data and discussion available in one or more appendixes that can be posted online. The master plan needs to be guided by a set of overarching principles and a design framework. While the basic values come from the institution’s mission, strategic plan, and academic focus, the master plan needs to express these ideals spatially and visually as well as functionally. The planning principles also need to address the issues identified during the background analysis. The spatial arrangement and visual appearance of a campus are central to its identity and are featured prominently in recruiting and public images of the institution. Today, a virtual tour on the Web often creates the first impression of the college or university and sets expectations about the institution for prospective students. The in-person campus tour should reinforce this impression and provide more depth about what a student’s educational experience will be like, now and in the future. Students arrange their schedules around the places where classes and activities occur—and later, as alumni, they locate their memories around landmarks and places that emotionally resonate with their college years. Some iconic examples are Harvard’s “yards,” the University of Illinois’ quadrangles, and Arizona State’s palm-lined pedestrian walks. Consider the messages conveyed about an institution by agricultural acreage, research labs, a large and stately library, a teaching hospital, a 100,000-seat football stadium, a “fraternity row,” a visible childcare center, or a prominent transit stop near the campus core. Explicitly or implicitly, they represent elements of the mission and values of the university. Accordingly, the campus master plan must be driven by what the university aspires to be. The campus of Lewis & Clark College is a very special place. The 137-acre site occupies the height of land in the predominantly residential Palatine Hill area of southwest Portland. The character of the campus is cast by its setting on the grounds of the former “Fir Acres” estate, with its landmark manor house overlooking a magnificent formal garden mall with views eastward to the Willamette Valley and the white cone of Mt. Hood beyond. The campus is framed by Douglas fir woods in the ravines and slopes at its edges—a classic northwest landscape that serves to unify the campus. The three major historical eras for the landscape of the Academical Village are reflected in the landscape as expressions of daily life, technological advances, student body size, leadership objectives, institutional growth, and other functional issues. Each era relates to the way that people interacted with the campus landscape and approached continuity with the past or implemented changes to the Grounds. . . .
[T]he Academical Village landscape has integrity to the latest historical period, the Jeffersonian Revival, 1948 to 1981. This finding reflects the fact that the University began treating the landscape of the Academical Village as a curatorial object in the early 1980s. Of course, most campus planners don’t enjoy the opportunity to choose a campus location or start from bare ground in developing a plan. Thus, a common challenge involves adding a new district or buildings to an existing site plan. The starting point for physical planning is recognizing the campus’s design framework, that is, the set of underlying physical characteristics and related principles on which the master plan will be developed. It is the distinctive, underlying pattern that provides comprehensibility and a sense of place to the campus. A successful design framework reflects the college or university’s identity and its uniqueness in the relationships among its buildings, open spaces, and environmental context. The master plan should acknowledge, respect, and build upon this framework. The design framework may take different forms and encompass different features. It may consist of a series of strategic greens or open spaces, dynamic vistas or views, architectural themes or palettes, specific iconic buildings, landscape features, circulation systems, topographical features, building density, scale and massing, or other physical characteristics that may be used to bring order to the campus. If the campus does not have a well-defined framework already, the master plan can establish one. In such cases, physical elements of the campus that will remain in the future and that can provide a basis for the underlying logic of the plan should be identified. They may include campus features that call to mind the institution’s character or tradition, landmarks that have helped define the campus, or patterns of spaces that have shaped the campus’s physical and mental map. Design charrettes, workshops, and/or focus groups (including alumni) can help staff planners and consultants identify these foundational features. Examples of how a campus plan could develop from its design framework could be reinforcing a traditional entry or processional axis of roads and walkways through the campus; adopting design guidelines that maintain an architectural style already associated with the institution, such as Georgian, gothic, or modern; adding towers or landmark buildings associated with the institution’s character; placing new buildings and open spaces to better define view corridors and long vistas; and placing new buildings to shape and enclose quads or greens that indelibly portray the campus image. Obviously, more than one of these may be part of the scheme on any campus. The principles set forth here are intended to help maintain and enhance Yale’s status as having one of the preeminent urban collegiate settings in the country. They encourage a walkable, gracious and sustainable campus environment, based on redesigning Yale’s public fabric to meld its disparate pieces and mesh the University with its surrounding neighborhoods. Princeton University needed a comprehensive framework plan to guide their next ten years of anticipated growth. The charge was to keep the plan rooted in their rich physical history, be able to influence a $3 billion capital program and enhance the campus infrastructure in sustainable and strategic ways. It had to maintain a pedestrian-oriented campus, preserve the park-like setting, and maintain existing campus neighborhoods while promoting a sense of campus community, be environmentally sustainable, and maintain strong community relations. The plan produced results at all scales—from the restoration of historic paving materials to the establishment of a regional transit hub. It has increased the amount of previous open space at new project sites, reduced stormwater runoff volumes and rates to local streams and lakes, met the development goals of the university, and reduced parking demand through transit improvements and policy recommendations. The University of Cincinnati’s assembly of buildings and landscapes has much to teach the higher education community. The collection of opinions regarding the campus’s appearance is as diverse as the campus community itself. An interested observer can find an integration of old and new structures and landscapes on this campus. The new structures and landscapes have received national, and occasionally international, attention from the press and the architectural community and have taken on “signature” status. Through careful master planning aligned with the needs of an increasing student population, Planning+Design+Construction is a steward to the physical environment preserving the University of Cincinnati campuses throughout the Third Century. A clear distinction between town and country is reinforced to support the academic land grant mission and promote the dual urban and rural character of Cornell. A compact campus is defined to promote academic and social integration, help unify the academic core, provide a range of opportunities to live on campus, encourage walking, and protect natural features and rural land. Academic growth is focused in East Campus, recognizing that the campus west of Garden Avenue can only accommodate a limited amount of additional development without significantly diminishing its highly valued open spaces and character. Landscaped open spaces and the natural setting organize the campus. The character of the campus as a whole and the places within it should be distinguished first and foremost by the landscape, both natural and designed. A range of uses are integrated in strategic locations to facilitate a sense of community, enhance student and employee amenities, and extend vitality on campus. Spaces for casual recreation, spectator sports and cultural performances play a vital role in the academic heart of campus, but some athletic fields are relocated to facilitate a compact, integrated core. A convenient campus circulator is introduced to keep all active parts of the campus well connected, reduce driving, and simplify the regional bus routes on the campus. The quality of open spaces and streetscapes is elevated to enhance the experience of the campus and physically unify it. Surface parking is gradually replaced by more structured parking, with no net increase in commuter parking, to achieve a compact, pedestrian-oriented campus. Collegetown and Downtown become even more vital to the university as targets for residential initiatives and potentially the locations for additional administrative uses, and possibly academic uses. The East Hill Plaza area is encouraged to evolve holistically with a mix of uses to become a distinct place that supports Cornell’s academic, worklife, and housing objectives, and complement Downtown and Collegetown. The need for new approaches to planning and development and new funding models is highlighted as critical to successful implementation of the campus master plan and Cornell’s other sustainability initiatives. In addition to spatial organization and visual imagery, the master plan must be guided by principles that express other university goals and values, such as sustainability, walkability, the importance of residential life, and the institution’s relationship to the surrounding community. Topics that warrant principles typically emerge through the background analysis as well as from the plan’s design framework. While some principles may be overarching, others will guide specific elements of the plan, such as academic facilities, housing, or circulation. The list of principles should encompass topics reflecting the real choices that affect the physical development of the campus. For example, the campus master plan needs direction from leadership regarding these kinds of issues: overall enrollment growth; the percentage of students who will be housed on campus; designated pedestrian-friendly areas; protection of historically significant, culturally significant, or environmentally sensitive buildings, landscapes, and views; development density (building heights as well as open space); landscape themes; and accommodation of major land-consuming uses (such as a stadium expansion). Some of these areas can be shown as development alternatives as the master plan is drafted, but the campus community and the professional planning team need guidance regarding their importance in order to draft the plan. Preserve historically significant buildings, landscapes, and districts. The historic core and sacred spaces are important symbols of Penn State’s tradition, dignity, and pride. More specific principles and policies lend themselves to direct measurement so that universities can monitor conformance as the master plan is implemented. At the same time, however, policies need to be sufficiently flexible to accommodate changing conditions. Just as the range of principles and policies needs to be appropriate for each campus, so do the actual elements or chapters of the master plan. Commonly, master plans will cover fundamental topics such as land use and site design, academic facilities, open space, housing, circulation, public facilities, and infrastructure. Some plans will include building and landscape design guidelines; others will defer this level of detail to a supplementary document. The following discussion addresses several key elements that should be in any campus master plan. This follows the fundamental framework of the plan: deciding what kinds of buildings and open spaces should go where on the campus. Typical considerations include environmental suitability, compatibility among land uses, and proximity (for example, to accommodate a 10-minute passing period between classes). The area designated for each land use in the site plan must be sufficient to accommodate enrollment growth and other changes anticipated in the plan, and to allow for future flexibility. Typically, campus planners use ratios based on current development patterns, considering building height and density and open-space requirements in order to maintain existing campus character. Occasionally, a campus plan will come up with a concept particular to the university mission that requires its own land use category and tailored set of principles. For example, when Cal Poly, San Luis Obispo was developing its 2001 plan, faculty argued that the term “open space” was too generic and did not recognize the active educational function of outdoor areas. This led to the designation of “Outdoor Teaching and Learning” as a land use to be protected and guided by a set of master plan policies. The next level of planning focuses on the location of specific buildings and their designs, uses, and orientations. Guiding principles for the plan might call for student-centered space or mixed-use development. This plan element will go further to consider how to accommodate those principles in both indoor and outdoor learning spaces. In addition, this element will address how and where faculty offices, research facilities, and other uses that support the academic mission need to be placed. Finally, support functions, whether they are to accommodate food services, student services, information technology, administrative offices, or back room activities, need to be incorporated in the plan, sometimes within multiple-use facilities and other times in separate structures. State-of-the-art academic space planning draws extensively from the strategic plan regarding the academic direction of the university and the background analysis regarding trends in pedagogy, learning style, and technology. Particularly as educational institutions recognize that learning occurs “everywhere,” traditional definitions of “instructional” space become less relevant. A partial solution to the limits imposed by physical spaces is to utilize the “virtual classroom” through online teaching and learning, and by distance learning through increasingly sophisticated electronic media. A holographic teacher in one location directly interacting with students in other places is not far-fetched. The advantages and disadvantages of these new approaches are being and will continue to be assessed and debated. Especially in higher education, where new technologies are frequently invented, developed, and first used, university planners and developers of the physical plant have a hard time keeping up. It is clear that institutions will not be able to anticipate all the teaching and learning tools that will be used in the future, but planners and designers must strive to create spaces and infrastructure with the flexibility to accommodate evolving technologies. During the master plan process, it is also important to consider the types of services that need to be provided on campus: services that are needed specifically by students and faculty, services that benefit from or require knowledge of the campus and that require coordination with academics or other campus services, and services frequently used by a considerable portion of the campus community. On campuses not near or closely integrated into a commercial neighborhood, certain retail and related services should be planned on campus to reduce the need for people to run errands off-campus during the day. In certain contexts, campuses—especially those with large residential populations—should include sufficient space for an appropriate selection of personal and entertainment services. Among the strongest images associated with college and university campuses are their open spaces. Some such spaces are expansive greens, quads, or plazas; some are signature entrances, gateways, or promenades; still others are more intimate yards or gardens, conducive to quiet contemplation and long conversations. Open space on larger and more rural campuses may also include significant environmental resources such as creeks or rivers, forests, and hills, or other topographical features. For many institutions, the open space constitutes an iconic setting that is forever linked to the campus itself. To the extent that a master plan contemplates new or redesigned open space, planners will want to first define the purposes of the space; they should also consider visual and environmental factors such as how the space is defined by surrounding buildings; pedestrian access; exposure to sun, wind, and noise; and protection from vehicular traffic. The University of Cincinnati’s 2004 master plan update includes a typology of open space, ranging from “leftover” interstices between buildings to clearly defined and designed open spaces on campus. Recognizing the importance of the open space on the Princeton campus, its award-winning master plan included detailed landscape design and restoration guidelines and plans, and reinstated the position of campus landscape architect. Many institutions include substantial residential development for their students, and sometimes for faculty and staff as well. Residential development is different in many ways from the development of academic areas of the campus. The residences need to be marketable to students, should be economically viable, and should be supported by facilities that residents want and need. These may include food services, health and counseling services, public safety services, academic support facilities and services, socialization and recreation places and facilities, retail services, laundry and dry cleaning, and childcare (especially for faculty, staff, and graduate student communities), among many other potential features. Finding the mix and balance that creates the most appropriate and feasible live-learn environment for an institution’s residents will also vary with the institution’s traditions, community context, and the size and demographics of the residential population. Wake Forest University specifically studied how to better accommodate a full range of student-life needs as part of its 2009 master plan for its Reynolda campus. Housing types must accommodate the market realities of the target group. Traditional dormitory-style residences are important for freshmen, but tend to be less attractive to older students and are unsuitable for married students, faculty, and staff. On many campuses, student apartment-style housing provides a transition from dorms to off-campus living; these residential developments also create opportunities for teaching community citizenship and independent living skills before students completely leave the campus environment. The master plan should cover the proportion of students housed on campus – ranging from none for commuter campuses such as community colleges to all undergraduates for some liberal arts colleges. The plan should discuss how students not housed on campus are accommodated, including the impact of enrollment growth on the local housing market. Similarly, particularly in communities with limited and/or expensive housing, the master plan needs to address housing for faculty and staff. Recreation and athletic facilities are an important part of any campus master plan, and depending on the scope of the athletic program, may be particularly land intensive. Athletic events, though usually short-term in nature, may also generate some of the most significant impacts on the campus and nearby neighborhoods in terms of traffic, parking, noise, and lighting. Recreation facilities used by the campus community may substantially overlap with those used for intercollegiate athletics at many institutions. Planning for these two different but interrelated needs poses challenges different from those of academic buildings. Recreation is sometimes included with student life and housing; and the outdoor space requirements for both recreation and athletics are often incorporated with open space in campus master plans. Some institutions also share recreation space with their local communities through joint use agreements. Circulation in this context refers to the movement of people and things to and within the campus. The master plan must address pedestrian circulation and wayfinding for students, faculty, staff, and visitors. In addition, the plan needs to cover road systems and parking, and other transportation modes, including bicycles, scooters, and public transit. Besides multimodal systems, planners must also consider the different functions of a campus’s circulation—not only the obvious ones of commuting and people moving within the campus core, but also access for deliveries and pickup services, emergency vehicles, maintenance, housing, special events, and mail. The master plan needs to include a discussion of campus connections to the larger circulation systems in the community – particularly how auto, bicycle, and public transportation routes approach and enter the university, and the capacity of these routes and intersections to handle university traffic. Enrollment growth and facility expansion on campus may require modifications and improvements in these off-site systems to ensure safe and efficient travel to and from the university. The award-winning master plan for the University of California, Merced covers all aspects of mobility on and off campus, ranging from pedestrian and bicycle circulation on campus to regional access by air, rail, and highway. As the physical infrastructure of the campus must support all instructional and support facilities, this is a critical component to any master plan. Thus, the plan should address how to maintain and expand these facilities and systems, some of which may be shared with the local community (such as water supply). This element also needs to address the availability of resources, such as water, energy and telecommunications, and storm drainage, waste management, and related infrastructure issues. The University of California, Santa Barbara’s long-range development plan lays out the infrastructure needed to fulfill its plan in some detail, including related approvals required by state laws such as the California Coastal Act. Environmentally sustainable development and operations should be a high priority on any university or college campus, especially given the costs and reliability concerns of essential resources such as energy and water. This area of campus planning also needs to address the more “mundane” aspects of resource protection, such as wells and other water supplies, wetlands and other recharge areas, mature woodlands, and other ecologically sensitive areas that may be on the campus or nearby. Many administrative units and student organizations now promote behavioral changes that make campus life more sustainable through initiatives like recycling, carpooling, and reducing one’s “carbon footprint.” Further, the academic mission of universities and the educational process have expanded to incorporate research and curricula focused on environmental protection, conservation, and restoration. Many campus leaders have expressed their commitment by signing the Talloires Declaration, created by the Association of University Leaders for a Sustainable Future, and/or the American College & University Presidents’ Climate Commitment, and by building LEED-certified facilities. Going even further, some universities publish regular progress reports on their sustainability efforts. Seattle University, for example, recognizes sustainability and environmental justice as central to the university’s mission. Colleges and universities often host events that attract large numbers of people from off campus, so the master plan needs to address where and how they may be accommodated. Typical examples include athletic competitions, homecoming, recruitment events, commencements, and other celebrations sponsored by the institution. Major public lectures, performances, and exhibits may also attract large audiences. In addition, student clubs and organizations may host fairs, concerts, and other activities. The university may also run programs whereby other organizations use institutional facilities—for example, for high school sports tournaments and community cultural events. In addition to providing indoor and outdoor venues, the institution needs to design its roads, parking facilities, and access to public transportation systems to accommodate attendance while mitigating traffic congestion and other off-site impacts. For example, the City of Portland required Lewis and Clark College to submit an event management policy incorporating conditions of approval. Campuses have historically been developed as places where faculty and students could be somewhat removed from the everyday world to pursue important intellectual activities in relative peace and safety. Always a concern, college and university security has become even more important because of terrorism and highly publicized incidents of sexual or deadly campus violence. Safety issues will affect the physical layout and design of campus facilities, incorporating such elements as defensible spaces, lighting and emergency call boxes, and security for sensitive or dangerous materials and equipment. In addition, with technology advances, information privacy and cybersecurity have become important campus issues. Campus police, as well as local and regional public safety and emergency response agencies, should always be consulted in the master plan process. Campus plans should also address public safety issues that might be associated with natural hazards and other events that might disrupt circulation and operations—such as severe storms, floods, landslides, earthquakes, and wildfires. Where possible, the campus plan can serve a preventive function (e.g., by not allowing construction in hazard-prone areas) or provide alternative circulation routes or utility access to reduce serious consequences when such events occur. The integration of the initial capital cost with the long-term operational needs should be an essential part of the master planning efforts of any campus. However, this is easier said than done for a variety of reasons. Most commonly, capital funding comes from a different pool of money than operational funding. For example, donors are often beguiled by paying for (and naming) a new building, but are generally much less interested in paying for the mundane ongoing operations and maintenance. Compounding this potential problem, construction budgets are often squeezed by escalating costs and demands from future academic users, such that added initial expenses for operational upgrades that will pay back only years in the future are dropped for construction budgeting expediency. However, thinking about the building’s longevity and flexibility starts when planning the site location and orientation requirements. A true commitment to life-cycle design and construction would reduce unnecessarily burdensome operational costs and deferred maintenance problems. Master plans come in a variety of shapes, sizes, and formats. With advances in technology, a web-based electronic format is becoming common for widespread access. Nonetheless, most plans are still designed for traditional publication in booklet format, which can be downloaded and used for reference. All plans should include an executive summary or other short version for broader use than the full plan. In some cases, an institution may need to follow an outline or format specified by state government, a university system, institution board, and other governing body. However, even in such cases, the formal plan may be accompanied by supplements or summaries in other formats. The master plan format should relate to the intended audience. For example, students and faculty (and community members) may find electronic, web-based plans especially accessible for their reviews, and for referencing the plan in academic assignments. Often, deans and fund raisers find summary maps and illustrations particularly useful for approaching donors and for use in broader capital campaigns. Summaries in the form of newspaper supplements or e-newsletters may be helpful in reaching the larger community surrounding the campus. Most plans, therefore, will actually be expressed in multiple formats depending on the specific use and audience. But in all cases, the core principles and the adjustment process must be preserved for the plan to truly guide the development of the institution’s spaces. This chapter emphasizes that the campus master plan is much more than a map, yet a series of maps and other illustrations are fundamental in showing the past and future development of the campus. Maps may include general land-use diagrams as well as more detailed circulation, infrastructure, or other topical maps. Some plans include illustrative views of what the future campus might be like. Also, for space planning purposes, the campus may be developed in sectors or precincts that reflect different uses (e.g., residential, medical center) and possibly complementary design themes. Link the master plan visibly with the university’s strategic plan and other high-level initiatives so that it is easy to locate on the Web. Make sure that the university’s search tool and directory link to the master plan. Keep the website current, noting specific dates. For example, if a news item indicates that the trustees approved the plan at its May meeting, be sure to include the year! Often, website maintenance declines dramatically after plan approval. Use the website to publicize process, invite input, post notes, and provide documents and visual images. The site can serve as a public record of the planning process. Make it easy for users to download the executive summary, as well as the full plan, separately from detailed appendices and technical reports. Further, downloading should not require specialized software. Also, clearly mark (or replace) sequential drafts. And be sure that the title for the document includes the university’s name and the date of the plan! Develop an archive—historical plans are not just curiosities, but often remain relevant references for current and future discussions. Review and approval of a master plan involve the educational institution, its governing board, and state and local governments. As the details vary significantly by state and whether the institution is public or private, these procedures need to be understood at the outset and included in the timeline. Once the plan is fully formulated, it may need to be approved by an internal campus planning committee before being submitted to the university’s governing body and system office (if applicable). While the governing body may formally adopt the plan, it is also subject to a variety of regulatory approvals depending upon the campus location. Further, if the university is in a state that requires environmental review, all of that documentation must be complete before the plan can be implemented. Thus, the plan itself or related documents need to cover all necessary permits and approvals required by local, state, and federal agencies. Early consultation with these agencies should help identify potential problems and possible solutions before too much effort and money are expended on planning. Across the United States, there is little consistency in how local communities and universities interact legally. Higher education institutions (at least public universities) are typically exempt from property and income taxes, which can be construed as placing a burden on the local community. For the purposes of physical planning, communities often establish an institutional or public facilities land use or zone, and/or treat institutions as conditional uses with a specified set of requirements or standards. These approaches recognize that large institutions typically differ significantly from surrounding land uses in terms of land ownership, building mass and height, operational activity patterns, traffic generation, and other such features that development regulations typically address. Thus, the political dynamics of the relationship between universities and their communities are critical factors in master planning, and it is important for campus planners to understand their state and local context. Many private universities are subject to local development regulations (zoning and building codes), while in some states public universities are exempt from local codes although they must comply with federal and state regulations. This occurs because some state institutions enjoy a parallel or superior agency status to local government, meaning they are accountable for physical development to their state governing board rather than to local government. However, even in the latter circumstances, neighbors can usually find standing to enter into litigation if they object strongly to university plans. A plan that is not implemented is merely an exercise—and one that is usually resource intensive and of limited value. Implementation is the process by which the plan’s vision becomes physical reality. Implementation of a campus master plan usually involves the following kinds of activities: more detailed planning, including design guidelines, capital construction, operational changes; and ensuring continuity in decision-making—all of which should be outlined in the master plan as the implementation strategy. Most importantly, the implementation strategy should include priority setting and phasing so that funding can be obtained and improvements scheduled over 5 to 10 years. At the same time, however, the implementation strategy needs to be flexible to accommodate funding opportunities that arise out of sequence. A master plan cannot answer all campus development questions at every level of detail. It is appropriate to leave some of these issues requiring greater levels of specificity for later work. Examples of follow-up work might be more detailed planning for specific sites or sectors of a campus, more precise function-specific planning (such as for circulation systems or utilities extensions), or the development of design guidelines. The master plan, however, should identify the needed follow-up plans, including, where possible, a proposed schedule or priority for completion. Penn State University prepares campus plans for each of its 24 locations throughout Pennsylvania, and then more detailed master plans for each academic college at the main campus at University Park to guide discipline-based facilities planning. The overall plan defines the principles, policies, guidelines, strategies and initiatives that apply to the Ithaca campus as a whole. This introduction sets the context for the campus master plan. It concludes with a series of tools and recommendations to support implementation of the plan. “Development opportunity sites” are identified along with “enabling projects,” “related projects,” and other initiatives to be completed to achieve the plan. The precinct plans focus on the distinct parts of the campus and derive directly from the overall vision and policy framework established in Part I of the campus master plan. Part II is a more technical document, intended for individuals and groups responsible for formulating, shaping, and reviewing capital projects on campus. It supports Part I of the campus master plan with further detail and provides for coordination between various initiatives. The master plan describes not only where new buildings are to be sited but also the location and nature of areas that should be kept open. Implementation, therefore, includes preserving open spaces essential to the campus character and function. A related challenge is to preserve sites most suitable for future development from inappropriate projects inconsistent with the master plan. For example, donor funding or other opportunities may drive new development at times or locations different from those laid out in the master plan. While such opportunities are generally welcomed, care must be taken to make sure these opportunities do not result in the premature forsaking of key sites needed for future facilities critical to the institution’s long-term best interests. One way to accomplish this is to include clear policies for building locations in the master plan itself and then to supplement them with more detailed guidelines that address building siting, massing, setbacks and the like. Most universities also develop landscape and building design guidelines to set standards for the designers of future projects, and many include design review procedures and committees that involve faculty as well as professional staff. These can be quite detailed depending on the university’s goals (such as becoming carbon neutral) and heritage (for example, maintaining an historic architectural style and consistent building materials). Preserving and enhancing images central to Haverford’s physical identity, especially Founders Green and the Nature Trail, is achieved by more efficient use of existing buildings and locating new buildings within the core. New construction will reflect Haverford’s historic buildings—simplicity, beauty, and permanence—but with greater transparency and openness. Two pedestrian axes extending through and beyond the campus core set future development parameters. New buildings will be oriented along these axes, enlivening paths and connecting campus uses. New greens are also organized along these paths. Structuring new development along these paths preserves the college’s beloved landscapes and vistas. Claremont McKenna College, another small liberal arts college, also includes design guidelines directly in its master plan. The master plan is the foundation for the institution’s capital improvement program (CIP) and related financial planning for the physical plant and operations. The integration of the master plan into the CIP and budget decisions is probably the most important element of implementation. The more clearly the plan articulates priorities and sequencing, the more likely it will direct capital expenditures effectively. For example, the University of Tennessee at Knoxville focuses its master plan directly on the capital improvement program required to implement the plan. Of course, all improvements require funding, and the sources for capital budgets are varied. Among the most important sources for new buildings are state allocations (for public universities) and donations. Master plans can be especially effective tools for stimulating capital campaigns precisely because potential donors can better visualize the future campus and how they can contribute to its realization. Some universities also pursue public-private partnerships to fund facilities that have revenue potential, such as student or faculty and staff housing. The master plan “sets the table” for the development of new buildings and related infrastructure. The plan should identify sequencing and priority (discussed further below) in anticipation of architectural programming, approval, funding, design, and construction. One of the most important aspects of plan implementation is the sequence that new development should follow. For example, an institution planning for enrollment growth must have the necessary academic capacity in place to accommodate that growth. Similarly, a residential campus will need to develop housing prior to or in close conjunction with growth of its student body. Clearly, related infrastructure and support services must accompany the increase in population and the development of residences. The master plan should articulate the logic of its sequencing and identify any “critical paths” essential to implementing the plan. Sometimes, the environmental assessment that accompanies the plan will specifically call out those developments that must take place early in the implementation to adequately support new development. For example, prior to or in conjunction with campus expansion, upgrades to the parking and circulation system may be required to mitigate traffic impacts. A good master plan will include an implementation strategy that describes key action items needed to turn the plan into buildings and spaces. One typical approach is to briefly describe the action item and to identify the responsible party, preliminary cost estimates, a likely funding source, and a generalized schedule (sometimes with milestones when the project is lengthy or complex). The compilation of these action items, perhaps with an indication of relative priority, becomes the framework of the capital construction portion of the implementation strategy. A strategy for addressing deferred maintenance— a significant challenge at most universities—should be included in the implementation plan. Appalachian State University’s master plan provides three implementation time frames for transportation, circulation and parking improvements: 0–4 years, 5–9 years, and 10 or more years. Some master plan goals and policies will focus on how the campus manages its resources, facilities, and infrastructure. Thus, the implementation strategy needs to address these matters as well, in terms of both phasing and funding. Operational changes in facility management can lead to greater efficiency and also meet sustainability goals in the master plan. Some practices may involve internal operations, such as landscape maintenance practices to reduce water consumption or changing to more energy-efficient lighting. And others may require broader cultural changes, such as providing disincentives to drive and park single-occupant vehicles on campus. Perhaps the most important and challenging aspect of master plan implementation is maintaining continuity with the institution’s goals and policies over time. As previously emphasized, a master plan is more than a map; it is also a set of policies or principles that promote decisions that will forward the plan’s vision as new conditions, issues, challenges, and opportunities arise. The master plan implementation, accordingly, requires that the plan be used explicitly in campus decision-making, including budget decisions. If a protocol that requires consultation regarding plan consistency as part of the decision-making process is not already in place, then a procedure should be instituted as part of the plan’s implementation strategy. The University of Maine, for example, explains how the university governance structure works with respect to master plan implementation. This is particularly important when the university experiences changes in key leadership positions, for example, in the presidency, of course—but also in senior academic leadership and in the administrative division that houses facility planning and capital construction. Implementation of the plan should be regularly monitored, perhaps on an annual or biennial basis. If action items have been listed in the plan with priorities and approximate schedules, it can be relatively easy to track which measures have been put into effect and which are lagging. Monitoring also allows for periodic evaluation of implementation measures: Why are some actions anticipated in the plan not moving forward? If the reason is not lack of resources or low priority, but rather a recognition that the action was misguided, irrelevant, or superseded by some other course of action, then such measures can be culled from the list. Many institutions issue public reports that allow stakeholders, including those involved in the development of the master plan, to gauge progress. A transparent process can help a campus celebrate successes as well as find reasons and possible solutions for lack of progress. The media for communicating reporting results are many and varied, and each institution will determine the approach most suitable for its circumstances. Every institution regularly monitors such factors as enrollment and capacity, features closely linked to the physical master plan’s implementation. Checking the correspondence between the plan and the actual conditions allows for adjustments to the plan or its implementation programs. Finally, in some cases regular reporting is required by law or policy. For example, in California, environmental laws require that mitigation measures associated with the master plan be regularly monitored for compliance. While the master plan is a “living document” or process that is continually adjusting to the programmatic needs of the institution, it also projects desired physical changes within at least approximate time frames. This balance—between flexibility to adjust to changing conditions and opportunities and providing effective guidance toward a comprehensive future vision—can be difficult. As discussed earlier, the inclusion of principles or policies within the plan can help inform decision-making so that unforeseen opportunities can be realized without jeopardizing long-term needs, and so that new challenges can be met without forsaking important elements of the institution’s future. Part of the flexibility desired in a master plan can be achieved by periodic assessments and amendments, especially with regard to changing programmatic needs. Updates are usually of two varieties: minor adjustments that do not significantly alter the fundamentals of the master plan, and major, comprehensive updates requiring a new look at the principles and framework. Generally speaking, minor adjustments should be easy to do, while comprehensive updates should be much more infrequent. For some institutions in certain contexts, the timing of updates is prescribed by law or policy. Aside from such requirements, it is difficult to prescribe an appropriate interval for updates. Rather, the timing of an update, particularly a comprehensive one, should be determined by changing programmatic needs and the early recognition that the existing master plan principles are no longer addressing key campus issues. See also Michael S. Rudden (2008), “Ten Reasons Why Colleges and Universities Undertake Campus Master Planning (and How to Align Your Campus Planning Effort to Best Address Them),” Planning for Higher Education, 36(4): 33–41. Linda C. Dalton, Amir H. Hajrasouliha and William W. Riggs discuss this expanded concept of campus planning in “State of the Art in Planning for College and University Campuses,” Journal of the American Planning Association, 84(2): 145-161 (Spring 2018). Richard P. Dober (multiple editions), Campus Planning, Society for College and University Planning. George Keller (1983), Academic Strategy: The Management Revolution in American Higher Education, the Johns Hopkins University Press. Karen E. Hinton (2012), A Practical Guide to Strategic Planning in Higher Education, Society for College and University Planning. Linda C. Dalton (2011) developed this graphic, which was then designed by the California State University, East Bay, Communications and Marketing staff. 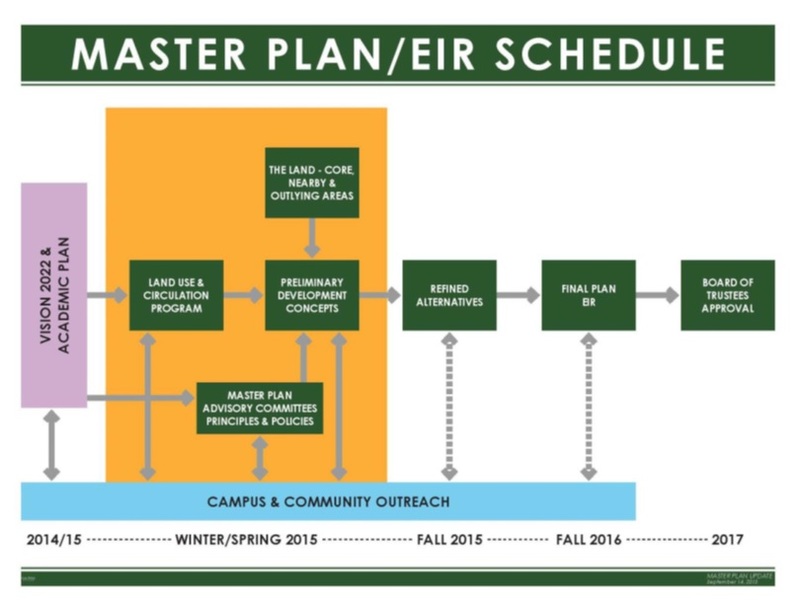 Robert C. Dickeson (2015), “Placing Academics at the Heart of Higher Education,” Planning for Higher Education 43, 2.
 http://masterplan.calpoly.edu Since the schedule shown here was published, the university has extended the environmental review process for the master plan. Universities with academic programs in city planning, architecture, landscape architecture, and civil engineering are likely to find faculty and students who want to be engaged in preparing the campus master plan. Of course, they should be involved in the process and may engage actively in advisory committees. Further, faculty with appropriate expertise can sometimes be hired as part of the master plan team. However, it can be challenging to incorporate student projects within the time line of the typical master plan process. For examples from the burgeoning literature, see Randy Bass (2012), “The Problem of Learning in Higher Education,” Educause Review (March/April); Persis C. Rickes (2009), “Make Way for Millennials! How Today’s Students are Shaping Higher Education,” Planning for Higher Education, 37(2) (January–March); and APPA (2008), “The Challenge of Demographic Changes and Accountability to Campus Facilities,” Center for Facilities Research, APPA (Thought Leaders Brochure). Work such as Clayton Christiansen and Henry Eyring (2011), The Innovative University: Changing the DNA of Higher Education from the Inside Out (San Francisco: Jossey-Bass); or, more briefly, Nathan Harden (2012), “The End of the University as We Know It”; and Michelle R. Weise (2014), “Got Skills? Why Online Competency-Based Education is the Disruptive Innovation for Higher Education,” Educause Review, November/December, represent this discussion in the United States. Some of the higher education literature in the United Kingdom interprets the implications as increasing market differentiation—with different futures based on institutional mission, financial security, and student clientele. See, for example, Michael Barber, Katelyn Donnelly, and Saad Rizvi (2013), “An Avalanche is Coming: Higher Education and the Revolution Ahead,” Institute for Public Policy Research (London); and Tom Kennie and Ilfryn Price (2012), “Disruptive Innovation and the Higher Education Ecosystem,” Leadership Foundation for Higher Education (London). http://campusplan.tamu.edu. This plan was updated in 2017. Further, in states that require environmental review, or if the National Environmental Policy Act applies, these options can serve as the alternatives assessed for their environmental impact. See also Gregory Dobbin, Veronica Diaz, and Malcolm Brown (2014), “Re-Imagining Learning Spaces: Design, Technology, and Assessment,” Educause Learning Initiative Paper 3; Michael O’Neill (2013) “Limitless Learning: Creating Adaptable Environments to Support a Changing Campus,” Planning for Higher Education, 42(1); and APPA (2006), “University Facilities Respond to the Changing Landscape of Higher Education,” Center for Facilities Research. See also “Asset Lifecycle Model for Total Cost of Ownership, Management, Framework, Glossary and Definitions,” APPA, 2009 edition.